An all-new manga series set in the world of Hasbro’s My Little Pony: Friendship is Magic! 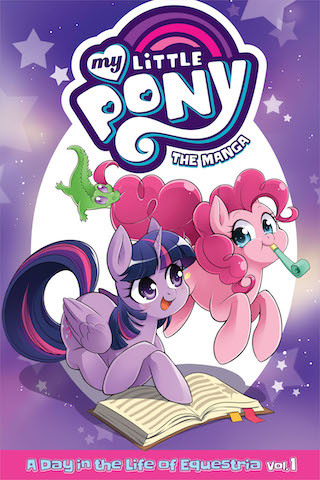 The world of My Little Pony comes alive in this distinctive manga series that spotlights each of the Mane 6 and a host of other characters from the land of Equestria! When Pinkie Pie lends a hoof to help Twilight Sparkle and Spike clean up the castle Library, she discovers a mysterious mirror with the power to gaze into alternate realities. Upon entering the portal-like mirror, Pinkie Pie sets off a chain of events that could spell doom for Equestria! Follow this adventure–and many more–in this hilarious new manga series for fans of all ages.